Turn the treat of chocolate-covered pretzels into a protein-packed creation with this healthy twist on the original. I know, I know—pretzels are a complex food that involves yeast, flour, dough-kneading, and twisting action. Making pretzels takes skill, know-how, and time. They're not something you make on a whim, and especially not something you make without experience or technical knowledge. That's why most people buy pretzels instead of making them—they're too much of a hassle to bother with, right? Wrong! Pretzels are easy to make—well, chocolate-covered ones at least. 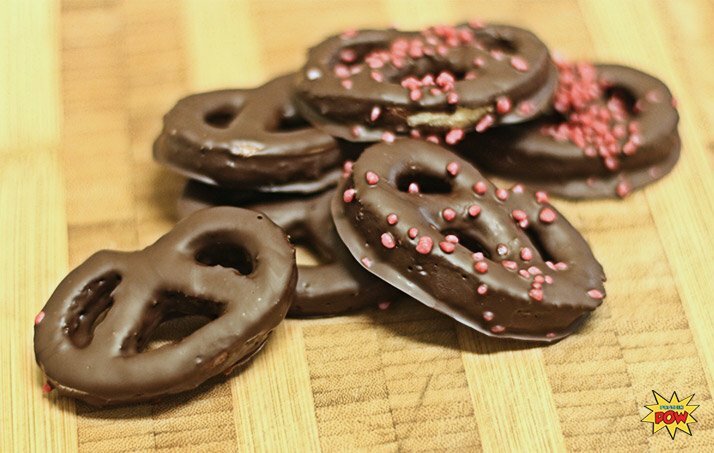 Chocolate-covered pretzels are flat, so you don't need to twist them. All you need is a good pretzel dough and a pretzel cutter. (I recommend this pretzel cutter if you're in the US or this one if you're in Europe). Now, the idea of making pretzels using a pretzel cutter may sound absurd to some of you. "That ain't no pretzel! That's a cookie you're making!" But I disagree with that reading of it. The cutter is all you need to make really tasty—and genuinely pretzel-like—pretzels! And guess what? You can make them healthy and packed full of protein, too. It's not wizardry, I promise. It's protein... POW!